Frederick Achom's Blog: Men – Welcome to the Kitchen! know what? I don't have a problem with that. Perfection in the kitchen is a good thing. Way too often there are televised cooking shows that are trying to make cooking into a competitive sport that you must win if you are good in the kitchen. 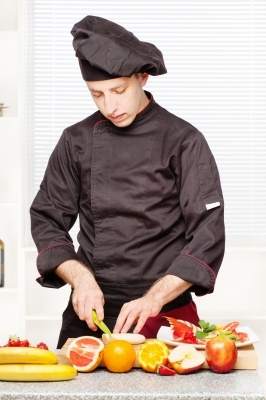 Programs that make it seem like you should either be the best or get out of the kitchen. But that's not the way of the kitchen. Being a good cook is about being creative and making the most with what you have on hand. It's about meeting time expectations as well as putting something on the table that meets everyone's different taste and diet preferences. It's time to take meal preparation out of the sporting arena and move it into the realm of art, because whether male or female, it takes a true artist to pull off a real meal.